In construction, the quality of foundations will directly impact the lifespan of a building. In parenting, providing a good foundation for your child in their early years can improve their life chances. In medicine, a solid research foundation can mean all the difference in identifying the most effective treatment. Foundations are a big deal. Needless to say, choosing the best foundation for your pocket sprung mattress doesn’t have the same gravity as parenting or medicine. However, similarly to construction, it may impact on the lifespan and performance of your mattress. If you’ve chosen a luxury pocket sprung mattress, the best foundation to enhance and take full advantage of the superior support your mattress can provide is a pocket sprung divan base. 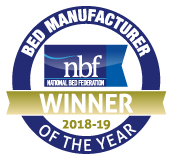 At Millbrook Beds we design our handmade divan bases to work in harmony with our pocket sprung mattresses. Our fully pocket sprung divan bases have a firm edge to provide a supportive foundation for your mattress. Shop our collection of divan sets in a range of luxury fabrics and colours and with a choice of flush fit storage options and find a great foundation for your sleep in a handmade bed from Millbrook Beds.